An exclusive set of silver writing instruments has been developed in tribute to the work of Shropshire silversmiths. The carefully-crafted pen and pencil have been manufactured in the Jewellery Quarter in Birmingham and have just gone on sale at Shrewsbury retailer Write Here, priced at just under £300 each. 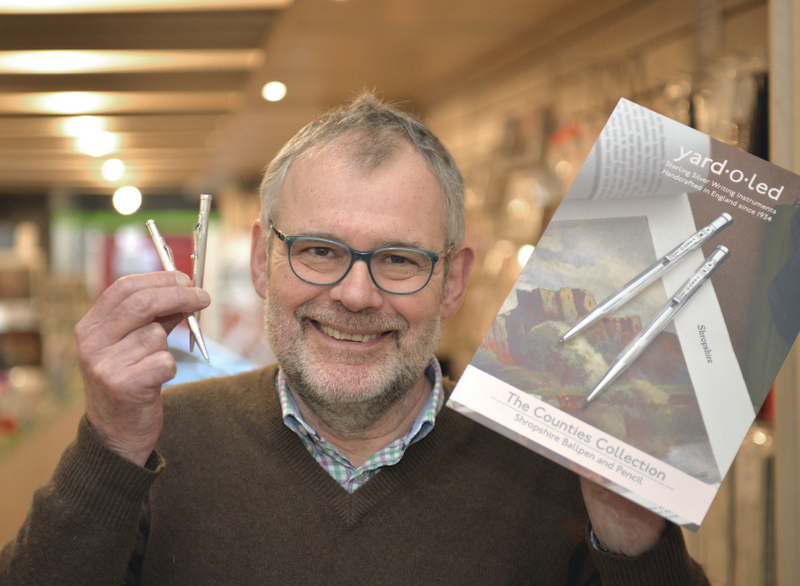 “The ‘Shropshire’ ballpoint pen and pencil have now arrived on our shelves and are looking very striking,” said John Hall, who owns the specialist shop in the county town’s High Street. He explained that Birmingham luxury pen makers Yard O Led, which has a heritage spanning almost 200 years, had named the new products after the county in recognition of its important role in the firm’s history. “There is a strong connection as many of the firm’s highly skilled silversmiths came from Shropshire,” said John. “In particular a man called Gordon Clarke from Albrighton was one of their most valued employees. Not only a skilled artisan, Gordon was a designer and engineer who could create new writing instruments and the processes to craft them. “He completed 50 years service with Yard-O-Led, starting as an apprentice in 1943 and then becoming a master silversmith. He passed away in 2009 but if any of his relatives are still living in the county we would welcome them into the shop to show them these special products. “The pen and pencil are classic Victorian designs inspired by the Yard O Led archives and we are delighted to be the only stockist in this part of the world,” John added. The Shropshire pen and pencil are crafted from solid silver and feature a distinctive pinstripe etching cut through by two chevrons and their octagonal shape means that they will not roll off desks. “They make perfect gifts for anyone who is proud of this county,” commented John. Yard-O-Led is so named because it was awarded the first patent for a mechanical pencil capable of holding 12 three-inch leds.